avoiding contact between the backs and the case. This unique system ensures excellent protection and the reduces temperature fluctuations. Two bow recesses, Hill-style bow holders,large accessory pocket,string tube,space for shoulder rest. 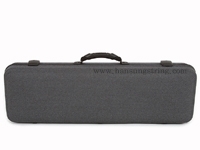 A special removable insert allows different size instruments to be carried in the same case. Two sturdy latches, carrying handle, fitted rings for carrying strap, velvet-lined. Nest available to take 4/4 or 3/4 violin.